I am offering my home for an exchange with a flat or something similar in the London area from where I can visit my daughter who's staying in Berkshire and a base to explore from. Vancouver Island is 20 minutes by float plane from Vancouver or 1 1/2 hours by the larger BC Ferries. The island is becoming more popular all the time because of the abundance of beauty and nature and outdoor pursuits as well as for it's multi cultural population. There is something here for everyone to do. 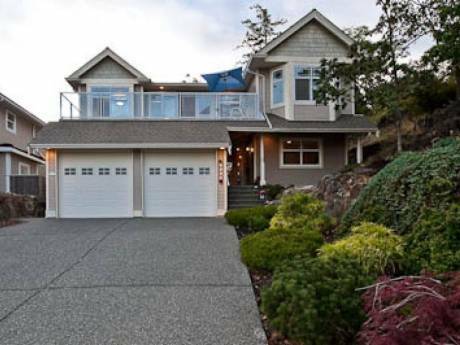 My home is a 5 minute drive to the waterfront/oceanfront of downtown Nanaimo. It is a small (100,000) but quaint old city center with a thriving arts district and an abundance of ethnic and trendy restaurants. The sunsets on the water are beautiful year round. There are boats to rent and surfing on the west coast (about a 2 1/2hour drive) at Tofino along with whale watching, hiking, world famous scuba diving and beachcombing. There is much to see on the east coast of the island as well like Victoria, B.C. Our "little England" and our province's capital with it's historic buildings, hotels, waterfront and shopping. Can be reached by car or train in 1 1/2 hours. Nanaimo is in central Vancouver Island so is an ideal spot for exploring all points north and south. There are miles of beaches and waterfront to explore, wildlife abounds yet we have all the conveniences of urban life. 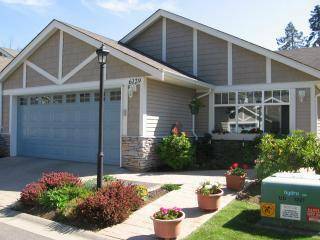 Our home is a fairly modern, comfortable but modest 3 floor townhome in a quiet area of Nanaimo. I would like an undetermined amount of time, whatever works for both, to exchange with someone that wants to visit our beautiful island. As I mentioned, my daughter has an au pair position in Berkshire, near Bracknell and I would love a place I could fairly easily visit her from and also travel to other places. I'm somewhat open to dates, again, whatever works for both parties. There are many eclectic and beautiful smaller (Gulf) islands within an easy drive and short ferry ride. Bill Gates even owns property on gorgeous Salt Spring Island along with other people of his ilk. The Gulf islands are famous for their abundance of artists, beaches, laid back attitude (you'd think you stepped back into the '60's! )and natural beauty. A car would be best to explore all the island has to offer. Car rental is cheap here as insurance poses a problem for exchange. A cat lives here but I would probably kennel her while away so if there are cat allergies, you need to consider that she has been here! There are 3 double bedrooms and 1 1/2 baths. 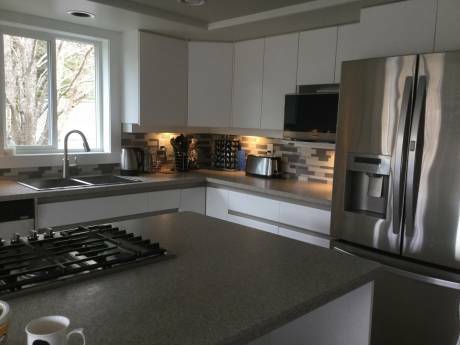 Kitchen is equipped with everything but a dishwasher. There is a small courtyard in the back to enjoy your morning coffee or whatever. Please visit www.nanaimo.ca to see what our gorgeous small city has to offer.